A Beautiful Ruckus: Is This Real Life?? Walmart is already an adventure even though I haven't actually taken the kids shopping with me yet. Every month I pick up 32 cans of formula to feed our little people. 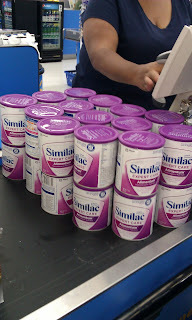 Yeah, that's over $1000 worth of formula if you are curious. We are blessed to qualify for a little assistance with that. Otherwise...holy cow! Anyway, I can't go to pick up that much formula without creating a bit of a scene. I try to do it all at one time so I don't have to think about it every week, but it always ends up drawing attention. Last week was no different. I unloaded 19 cans of formula (that's all they had, I'll get more this week) onto the checkout belt and proceeded to start unloading the rest of our regular groceries. Cashier: Those aren't all for one baby, are they?! Me: Oh no. I have quadruplets. Lady in front of me: *stops mid-credit card swipe and her jaw drops* You have what?! Lady: How many IS that? Lady: You have four babies? I've seen stuff about people like you on TV but I've never actually met someone in real life! Too funny! Based on the response to just buying formula, I'm guessing that the stories will get even better once we are finished with lock down and we actually start taking the kids out with us! lol! So funny! Can't wait til you can take them out! You should have a hidden camera for people's reactions available at all times! Oh yea, the question will get worse once you venture out in public. I've learned to keep my head down and avoid eye-contact or you'll never make it to the back of the store before the babies go into melt-down. That is so funny! I know that will be me before long. My husband and I are expecting our quads in May/June. Thanks for sharing a laugh!! God Bless y'all. You will continue to get the questions and the stares. I can't imagine Congrats on the beautiful little darlings. Thanks for the suggestion, FryGirl! I may have to look into that. I would certainly streamline my shopping trips! We haven't taken our kids out in public yet, but I've often wondered how far we will get with all of the people out there. I hate being rude, so your suggestion seems perfect! Answer their question, but keep moving. Thanks! I'll remember that! With the attention I get with twins I can only imagine what it will be like for you!! !